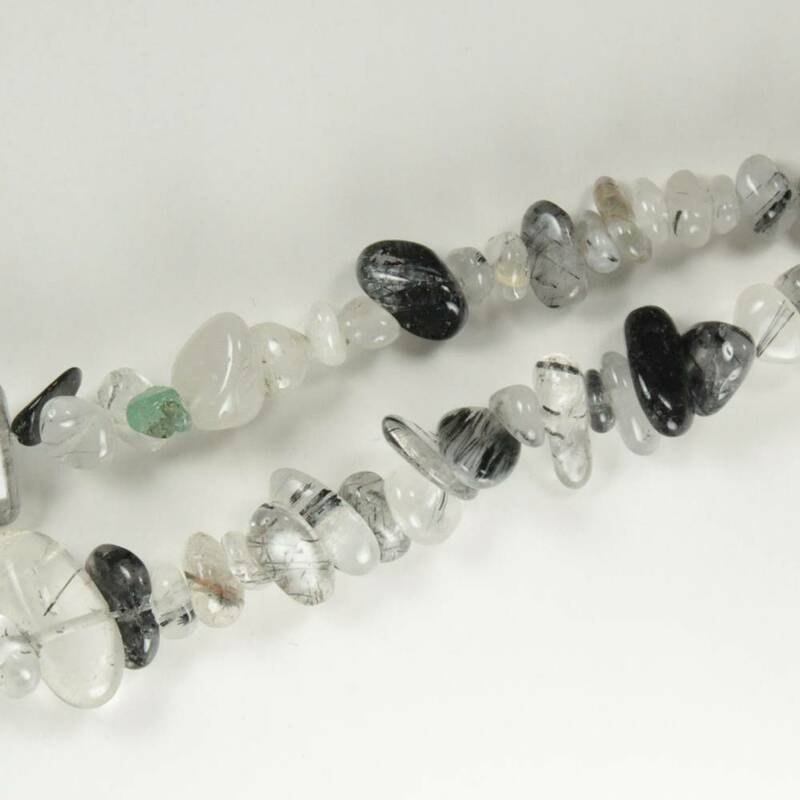 Gorgeous Tourmalinated Quartz beads in a range of sizes and shapes. How many beads are on each strand? 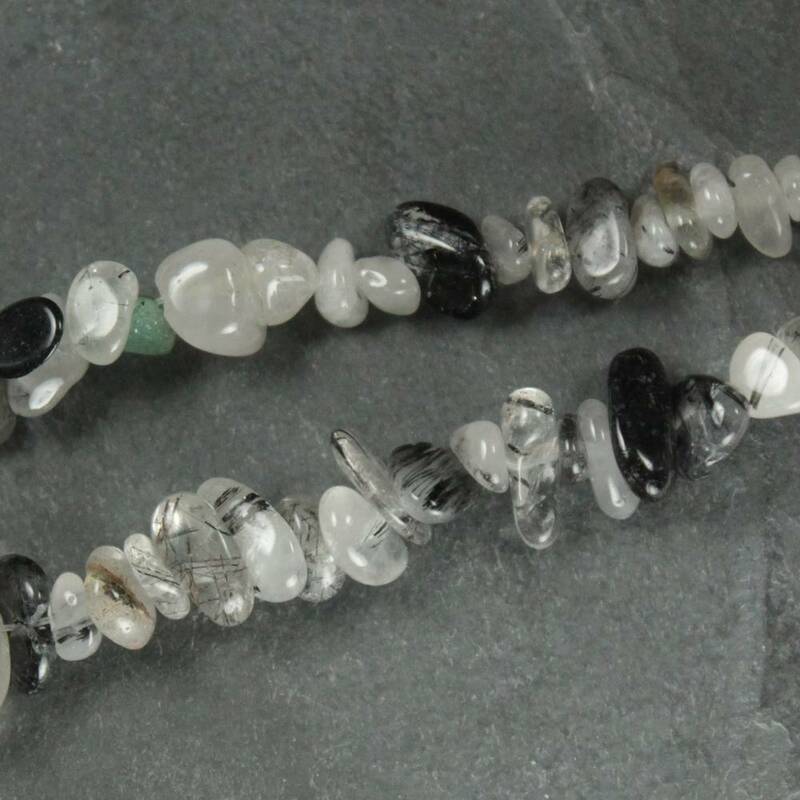 Gorgeous clear, white, and black beads cut from pieces of Tourmaline included Quartz. We currently sell these in three different shapes – round beads, tumbled chip beads, and tumbled nugget beads. These are incredibly popular with modern jewellers – often set with silver when cut en cabochon, but of course, these are beads! We also sell a few different types of included Quartz beads, if you’re interested in making a combination piece. For more information about Tourmalinated Quartz, and a full list of all of our related products, please see our main ‘Tourmalinated Quartz’ section. We do sell a range of other gemstone beads, too – see our main ‘Beads’ section. You may be interested in just how many of these beads fit on each strand we sell! The table below should give you some idea. Every number and every strand is approximate, though. You might get a 39CM strand, or have one or two larger or smaller beads. 2MM Round Beads Approximately 200 beads per 40CM strand. 3MM Round Beads Approximately 135 beads per 40CM strand. 4MM Round Beads Approximately 100 beads per 40CM strand. 5MM Round Beads Approximately 80 beads per 40CM strand. 6MM Round Beads Approximately 66 beads per 40CM strand. 7MM Round Beads Approximately 55 beads per 40CM strand. 8MM Round Beads Approximately 48 beads per 40CM strand. 9MM Round Beads Approximately 45 beads per 40CM strand. 10MM Round Beads Approximately 40 beads per 40CM strand. 11MM Round Beads Approximately 37 beads per 40CM strand. 12MM Round Beads Approximately 34 beads per 40CM strand. 13MM Round Beads Approximately 30 beads per 40CM strand. 14MM Round Beads Approximately 28 beads per 40CM strand. 15MM Round Beads Approximately 26 beads per 40CM strand. 16MM Round Beads Approximately 25 beads per 40CM strand. 18MM Round Beads Approximately 22 beads per 40CM strand. 20MM Round Beads Approximately 20 beads per 40CM strand. Tumbled Chip Beads Approximately 300 beads, per 36” / 90CM strand. For more information and a full list of all of our beads, please see our main ‘Beads’ page.